I’ve been dreaming of green tea white hot chocolate. t Over the last couple weeks, I’ve been working to create different gourmet flavors of hot chocolate. We’re all familiar with the classic hot chocolate, peppermint hot chocolate and sea salt caramel hot chocolate. All of which are often seen at Starbucks during the winter holidays. So, I thought I’d take the idea of flavored hot chocolate and create my own line of hot chocolates. Cocoa no longer has to be a seasonal thing! t But then again, what could be better than different flavors of hot chocolate to keep us warm through the frigid winter cold? t Today, I wanted to share green tea white hot chocolate. Just imagine the sweet creaminess of white chocolate melted in a combination of milk and half-and-half. 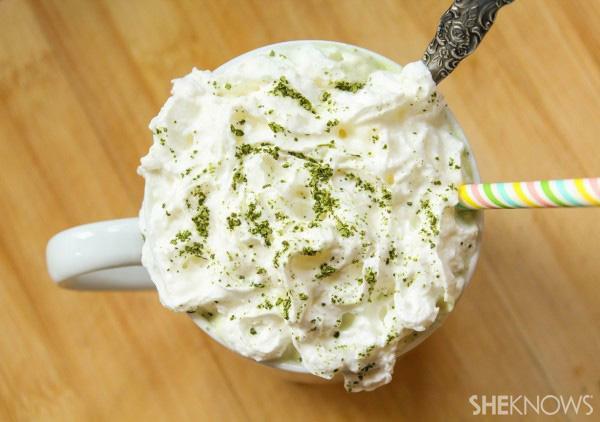 Flavored with the fragrance of green tea, then topped with whipped cream and a pinch of green tea powder, this hot chocolate will become an instant favorite. t It’s super easy to make too with just a few ingredients. t I hope you’ll enjoy this hot chocolate as much as I do. Heat milk and half-and-half in a small pot over low heat until the milk starts to simmer. Add the white chocolate chips into the pot and stir continuously until the white chocolate chips have dissolved completely. Now, add green tea powder into a small bowl. Pour a spoonful of the warm milk into the bowl, and stir until the green tea powder has completely dissolved into a paste and no longer appears powdery. Scrape the green tea paste into the pot of milk, and stir the milk until the green tea is completely incorporated. Pour the milk into a cup and garnish with whipped cream and extra green tea powder. Serve the hot chocolate warm.